By Father Alexey Young, from "Christian Bioethics". "In our eyes, illnesses appear only as paiful, unpleasant, indeed terrible...but in God's All-Wise and Most Merciful Providence, not a single illness remains without some profit to our soul...not a single sickness sent to us shall return void...For man the earthly life, life in the body, serves only to prepare us for life eternal...Therefore we must, without delay, make use of this present life to prepare ourselves for that other life to come." A latter-day father of the Church, Saint Ignatius Brianchninov, further explained that earthly life--this brief period--is given to man by the mercy of the Creator in order that man may use it for his salvation, that is, for the restoration of himself from death to life." This means that the focus of one's life is not primarily here, and therefore not political or sociological, but there, in the next world, in the Kingdom of Heaven. 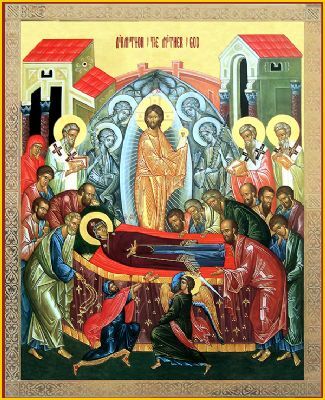 This is vividly illustrated by the final words of the righteous monk, Theodore of Svir (+ 1822) who, on his deathbed, said: "God be blessed! God be blessed! I have crossed the stormy sea of life and endured many troubles, but now the coast is in view." "We should not forget that in our age of "sophistication" even little children are spiritually harmed by what they see and hear. As a result, purification is required, and this is only accomplished through bodily suffering...You must understand that Paradisal bliss is granted to no one without suffering."